Moussa Sylla was born about 1947, in a village called Kindia, in the mountains in Guinea. He was not 'Griot' - his family caste was NOT to be a musician/dancer/performer, so it was not acceptable in his family that he wanted to do that; in fact it was despised. When he was very young he began dance and drumming lessons - his teacher was very strict with him - he was treated as a servant and had to do whatever his teacher wanted him to do (e.g. odd-jobs) and only then was he taught (as he was not paying, and that was the tradition, he was a sort of apprentice). If he got things wrong he was told off very severely, maybe even beaten and had to practise long hours. At the time the government in Guinea supported the arts - Guinea was renowned in West Africa for it's traditional music and dance - and he was chosen when still very young to join the National Ballet (Ballet National d'Afric) - so he left home against his parents wishes and went and joined them as a dancer - he was an excellent dancer. He was there at the same time as Mamady Keita (a famous drummer who has come to the West). It was an intense time of very hard work with lots of performances. When he was in his 20s or 30s he travelled around the whole of West Africa, visiting villages and learning their rhythms, stories, dances and songs. He was one of the few who knew so many; he valued his tradition and never wanted to westernise it. Later in life he moved to the Gambia. 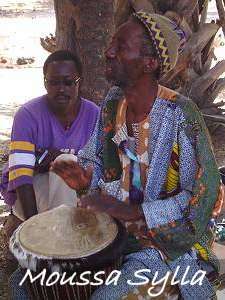 It was Moussa who really brought djembe-playing there - before him and his group there was no djembe playing in the Gambia. He taught 100s of Africans to play and many of the well known African teachers in the West were originally taught by him. He was a sort of patriarch to the Guinean community in the Gambia and helped and fed so many. He experienced times of being relatively well off and times of extreme poverty and hunger. He was very traditional in his beliefs; things such as Juju healers, curses and spells were all part of his life. He died in November 2006. He had been ill for a while and was losing his eyesight. He is survived by his wife Fatumata and daughter Bundau.